The federal government creates some artificial incentives for financial risk taking. These are mostly guarantees against losses, either explicit or implied by similar, past acts of loss indemnification, i.e, bailouts. Under this regime, successes accrue to private risk takers while failures are borne by taxpayers and others from whom resources are diverted by artificially low user costs. This is a huge source of waste, pure and simple. The financial crisis that began in 2007 featured bailouts of a variety of privately-owned institutions such as banks and insurers, as well as government-sponsored enterprises (GSEs: Fannie Mae and Freddie Mac). So-called financial reforms enacted in the wake of the crisis, especially those embodied in the Dodd-Frank Act, did nothing to eliminate the expectation that losses, should they occur, would be met by a rescue package. That quote is from Holman Jenkins in “Bank Bashing: the Modern Nero’s Fiddle“. Jenkins accepts “too big to fail” (TBTF) and government guarantees as a reality, blaming the financial crisis on other aspects of government regulatory policy. And there is plenty of evidence that the government contributed in a number of ways, contrary to the usual media narrative. I don’t disagree, but federal guarantees have, and still do, distort risk-reward tradeoffs faced in the financial sector. And the guarantees don’t stop there: federal bailouts of large or politically-connected firms in other industries are now more commonplace and they will continue. 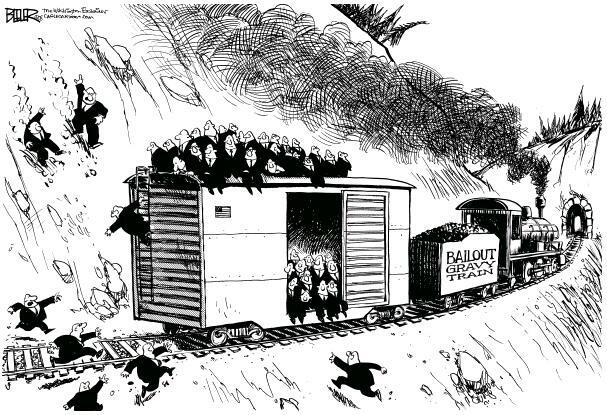 Today, the expectation of federal bailouts even extends to other levels of government saddled with insolvent pension funds and other debts that can’t be paid. There is no doubt that taxpayers will be called upon to cover losses should another financial bubble pop, whether that is in housing or other assets. The one-sided risk this creates represents a transfer of wealth to the financial sector. What’s worse is the contribution of government policy to the sort of economic instability this creates.